William “Woody” Woodward was a 2B-SS for the Braves from 1963 to 1968, and a shortstop for the Reds from 1968 to 1971. His greatest playing time came during 1966-67 with Atlanta. Woodward was signed by the Milwaukee Braves in 1963. 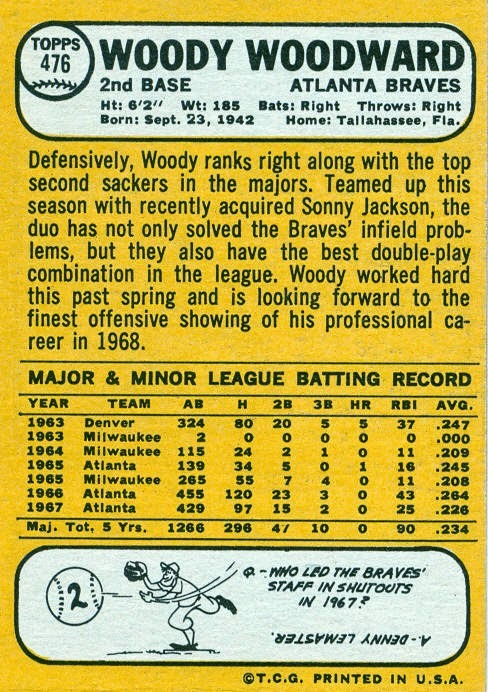 After playing shortstop with their triple-A Denver Bears for most of the season, Woody made his major-league debut that September. 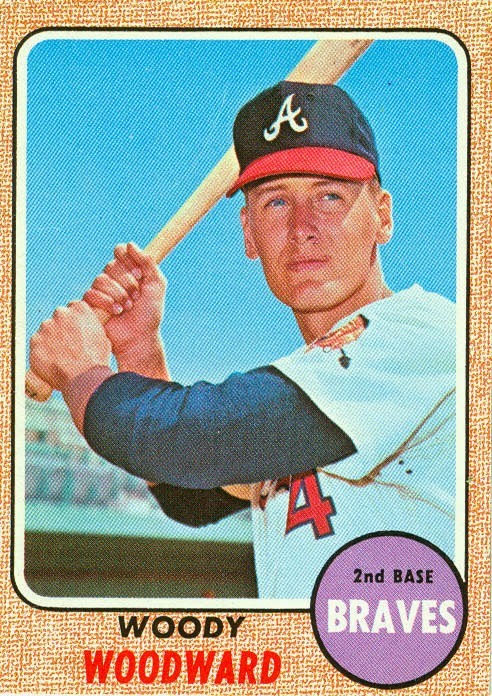 Woodward stuck with the Braves for the entire 1964 season, backing up 2nd baseman Frank Bolling and shortstop Denis Menke. 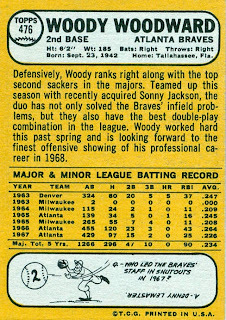 Woody began the 1965 season with the triple-A Atlanta Crackers, but was called up to the Braves in late-May to fill in at shortstop for Menke, who was out of the lineup for 5 weeks. Even when Menke returned, Woodward remained the primary shortstop, starting 92 of the final 132 games. 1966 found Woodward back as the swing-man between 2nd base and shortstop, but this time he was the primary 2nd baseman, starting 69 games to Bolling’s 57 starts. Woody also started 67 games at shortstop. He collected a career-high 43 RBI this season. Frank Bolling was jettisoned after the 1966 season, clearing the way at 2nd base for Woodward, but Woody had someone else to worry about now – rookie 2nd baseman Felix Millan. Woodward started 114 games at 2nd base, while Millan started 37, mostly in late-April and the final 19 games of the season. Woody also made 15 starts at SS, all in September, with Menke again out of the lineup after 9/6. 1968 brought a change in the Braves’ keystone combo. With Millan starting first 64 games at 2B and newly-acquired SS Sonny Jackson (coming from the Astros for Menke in the off-season) starting the first 35 games at short, Woodward was the odd man out. After a few starts at shortstop in May, Woody was traded to the Reds (with pitchers Clay Carroll and Tony Cloninger) for pitchers Milt Pappas and Ted Davidson, and infielder Bob Johnson. Soon after the trade, Woodward started 16 consecutive games at SS filling in for Chico Cardenas, then settled in to a backup role. The Reds traded Cardenas to the Twins prior to the 1969 season, and after experimenting with Darrel Chaney and Chico Ruiz for 92 games, Woodward took over the starting shortstop job on 7/25, and started the rest of the way. In 1970 Woodward shared the SS job with rookie Dave Concepcion. (Uh-oh, can anyone guess where Woody’s career goes from here?) He also hit his only career home run in 1970. 1971 was his final season as a player. He started 65 games at shortstop, but that was 20 less than Concepcion. Woody also started 7 games each at 2B and 3B. After his playing career, Woodward worked as a Reds’ TV commentator for a short time, then was the head baseball coach at Florida State University (where he had played before turning pro) from 1975-78. Woody then worked in the front office for several teams. He was the Reds’ assistant GM from 1981-84, Yankees’ GM from 1985-87, Phillies’ GM for the first half of 1988, and the Mariners’ VP of Baseball Operations from July 1988 through the 1999 season.